FilePro allows you to take complete snapshots of drives or directories. These snapshots hold the exact state of the drive. 2. Compare snapshot against current disk state, and examine changes. 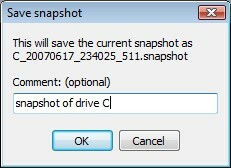 To generate a snapshot you first need to generate a "treemap" or perform a "directory analysis" on the drive. When the treemap is generated, click on the "Save snapshot" button, shown here. You are then asked to enter a description for the snapshot. When you restart the program, if you want to load the snapshot we just created you click on the "Select volumes" button. Then the "select volumes" window opens, which allows you to load any saved snapshot. When the snapshot is loaded you can view the exact treemap, as of the time you saved it. You can also see the directory analysis, at that time.